Move the hen and babies (or eggs) at night. 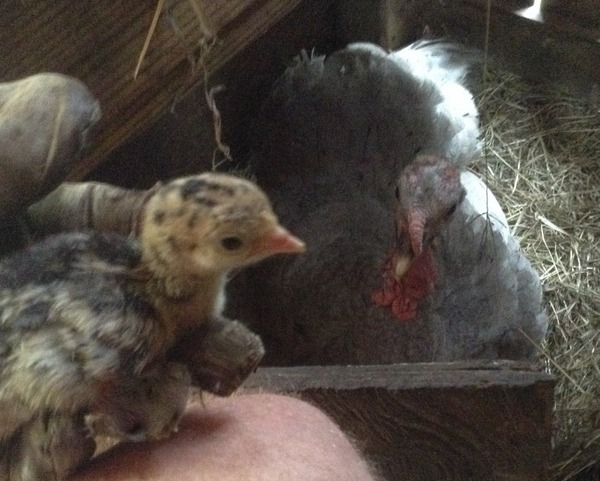 The 28 day wait is over and you have newly hatched turkeys! Now what……? 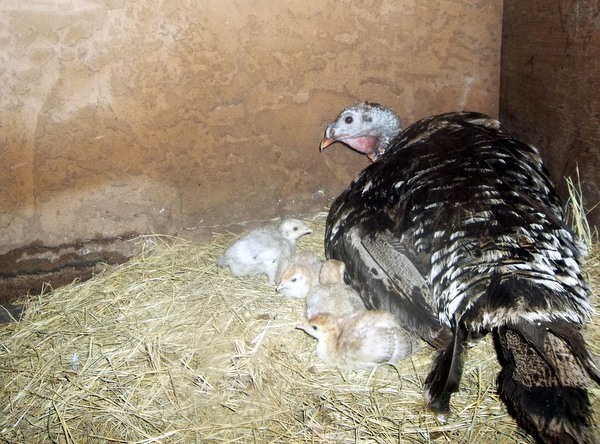 By the way: Rain and the resulting hypothermia is one of the biggest killers of baby turkeys. 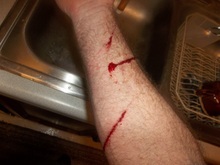 Or make the attempt to coax or carry to a secure pen. Normally turkeys are astonishingly easy to herd (coax) most anywhere you want them to go—if you do so slowly. Still on occasion, for example if I miscounted or marked the calendar wrong for the “28th day” –I arrive home to find a mother and babies strolling the yard. I will pick up a pair of sticks to assist in guiding the family and very, very slowly put pressure (walk towards) the hen using the sticks as guides. 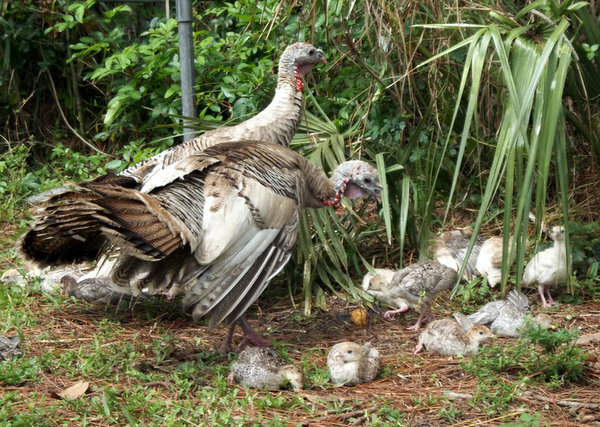 As much as possible, guide the poults away from bushes or tall weeds—stay clear of potential cover even if your herding route is doubled—avoid going near anything the baby turkeys could hide in. If given the opportunity, the poults will rush for shrubbery and not come out, or get stuck in tall weeds. If you dare to make a move to help one of the stuck poults---mom will flog you. The flogging is not so bad, perhaps a little blood, a little sting, but the real concern is that often when the mother hen attacks you- she inadvertently injures her own delicate brood. If this sounds like herding cats (or chickens for that matter) you can see that whenever possible we avoid the herding process & simply move (pick up hen and poults) while they are still on the nest. Suggestion: wear an old long sleeve shirt (or two) and leather gloves. Also, take this opportunity to remove any shade or rain (palmetto leaves) you might have placed over the hen & then take the clippers and trim branches and brush that will hinder you grabbing the poults and then the mother. Reach under bird carefully lifting her a few inches and get an approximate count of poults. If the mother hen is not too upset remove the empty shells & count them to verify how many babies you will have to move. 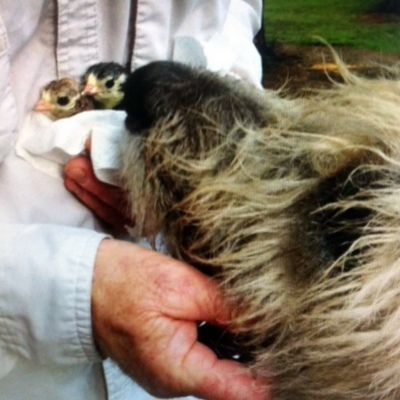 On the 28th & 29th day, most of the poults will be newly hatched and too weak to run. However any poults that hatched early are quite willing to flee. Unless there is a reasonable fear of predators, do not be in a hurry to move the birds. 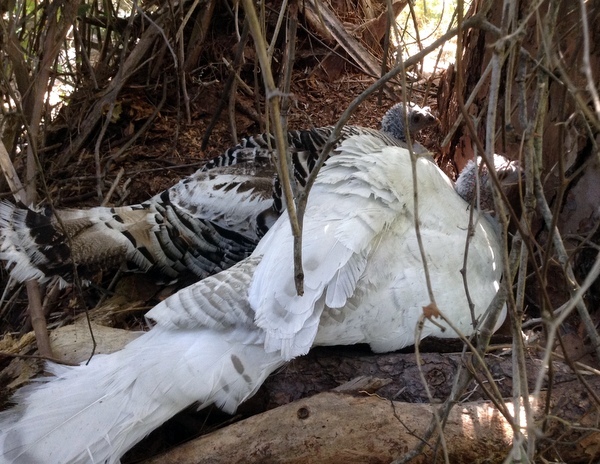 Poults survive up to 3 days without feed or water. 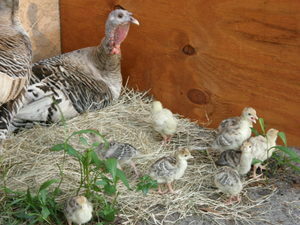 There is an equilibrium you are looking for: Leave the poults and mother alone so mom will imprint on her new babies. Seems like the Young hens require more time to become attached to their young. (8-12 hours) Then again if you wait too long you will have a nest of active sprinters. In general, we choose sundown as the time to move the hen and poults, hopefully giving the hen and poults time to bond. Another factor considered for moving the hen is approaching storms. –A simple rain shower in “no problem”, however if the weather satellite shows a three day storm approaching—well the decision has to be made to move the hen and poults. 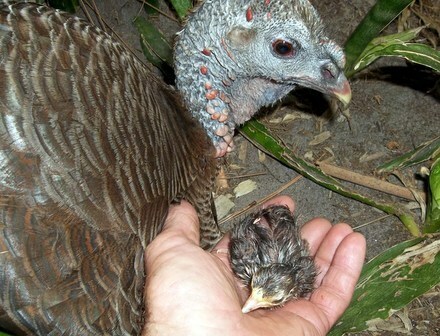 Rain can be deadly to baby turkeys. Last thoughts: On the east coast of Florida we have many nocturnal predators. Whenever possible we do not let the mother and hens remain unguarded overnight.—the reasoning: the new poults cheeping under their mother will call in predators. Ready -don your gloves and arm guard & grab the little ones! The scratches in the picture actually came from a 3am rescue of a hen and jake from a hungry bobcat, (no scratches until I tripped on a vine in the dark for a noisy You Tube moment) however the picture does serve as a guide that the dinosaur claws will tear holes in your clothing or arms. Note the glove, armguard and mommas' interest! Note the cupped hand over the poult. *****As you bring the baby turkey out from under mom, cup your hand over the poult for protection, because the mother will be pecking at your hand and arm. Don’t let her peck her own babies! Have bucket with a small amount of shavings handy and gently place the poults and in the bucket. Repeat. If there are 8 poults, the process will only take approximately 12 seconds. When you begin grabbing poults, always pick the most alert first as these are the ones most likely to run into cover. Attempt to count how many may have run into the brush. 98% of the time, the mother hen will not move from the nest because she cannot see how many birds are under her and she will still be sitting when you have grabbed the last poult and placed in it the bucket. At this point, reach down and in one quick motion grab the hen; immediately pinning her wings to her side. Normally she will not bite, although you may be scratched as she kicks her legs in panic. Hence the reason for the old shirt as the talons on her feet may (will) dig into and tear your clothing. Pick up the bucket of poults and carry both to an enclosed pen; ideally one that has a dry area safe from rain. We have a large pen in our outside garage and hence no worries about inclement Florida weather. Forgot one! So...... Rockman loves to guard his turkeys. However mother hens do not necessarily love Rockman. We put the dogs inside during this process or...... Well things get ugly. Keeping hold of the hen, carefully place the poults on the pen floor, preferable onto wide soft wood shavings (never sawdust). The hen will begin squawking as she sees and hears her babies squeaking tiny panicked alarms. When the bucket is empty back up a few paces and set the mother down. Naturally she will be quite upset and squawking in protest. Back out of the pen and shut the door. Usually she will gather her poult to her and settle down fairly quickly. First time mothers may take longer to settle down as they are not used to having poults and being moved. Silently return to the nest area listening for any peeping. The newly hatched poults will be calling their squeaky version of the “lost turkey call” for their mother and you can locate them fairly quickly. Catch and place near mom in the pen. 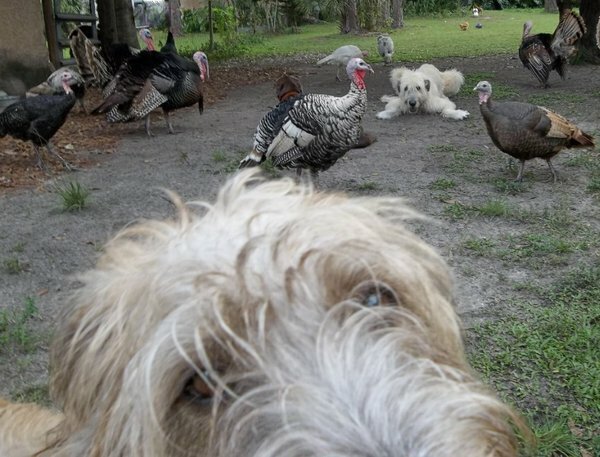 An interesting twist on the squeaky lost babies is written out on the turkey miracle story page. Inspect remaining eggs: Upon confirming there were no runaways, inspect the remaining eggs if any. Place any viable eggs in an incubator and dispose of (bury) rotten eggs. How to check the remaining eggs? The simple and yet effective answer came to me by sheer coincidence. I do the "Cold egg test"
Simple: place the questionable eggs in a container or even leave on the nest for 10 to 15 minutes, wait 20 if needed. Now check the eggs. The live eggs will still be warm and the dead (rotten) eggs will be cold. Carefully dispose of the rotten eggs without bumping too hard or they will “pop” yuck. Update: Just moved mom and babes to the indoor pen, then returned to the nest. 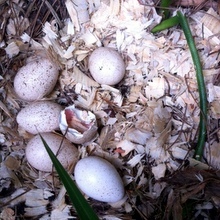 Three of the eggs are pipped and will hatch within 1-12 hours. Two are "unknowns" The three live and two unknowns were placed in a pre-warmed incubator. The remaining empty shell was buried in the garden. The Hybrid move. 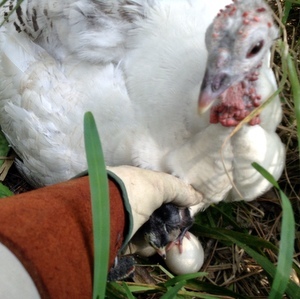 On occasion, for example when it is impossible to grab the hen; we use a hybrid method. 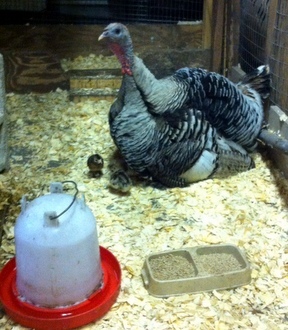 That is, place the poults in a bucket and allow the baby turkeys to call for their mother as you walk towards a secure pen. The hen will follow her babies and will be quite upset-even angry. At the pen, shut the door behind you, place the poults on the ground and then open the door. “Get out of the way” & then shut the door on hen and poults. Moving hens and eggs before the eggs hatch. Let the hen sit on the nest on or two nights and then move the hen at night and place her on her new nest in the dark and let her wake up on the new nest. The problem I could see would be if the hen panics when you place her and refuses to sit on her eggs, mostly because she cannot see the eggs. My added suggestion would be: if available, exchange eggs with some ceramic eggs before the move, and that way if the "Hen Relocation fails" the eggs are not getting cold. Of course this means you either have to place the eggs in an incubator or broody hen OR exchange the eggs before the hen actually begins to warm the eggs (during the laying phase). 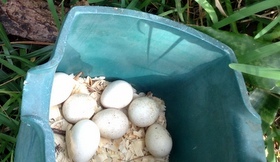 Note, I often exchange the eggs anyway during the two weeks when the hen is laying, but not sitting overnight. The reason is to keep the eggs from getting raided by the roaming opossum.-During that time I attempt to build some type of predator shelter around the nest and give the real eggs back to the hen once she goes broody. Note: During Hurricane Irma, I moved two hens at night and they took to their new location---good stuff to know. I needed to the preheat the incubator, use some fake eggs and a flashlight to light the eggs after placement.